Trump’s anti-environment agenda could propel the movement forward. He’ll give them something concrete to fight. 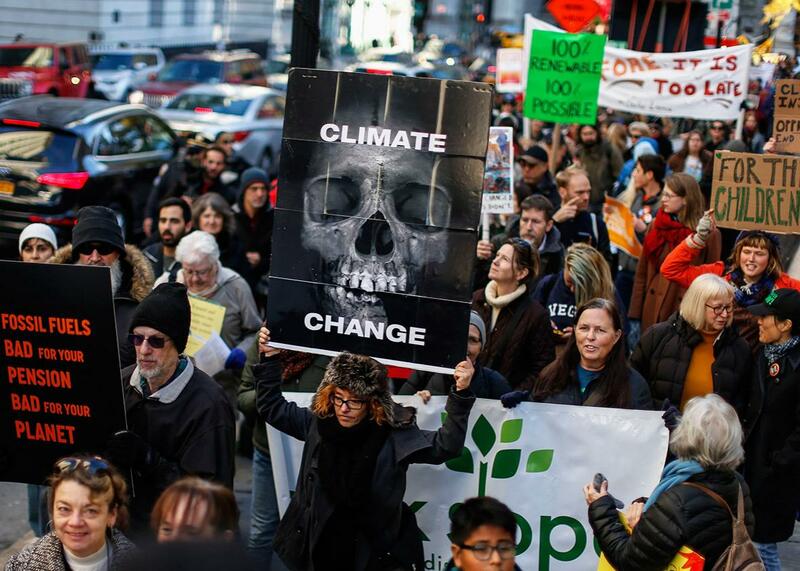 Participants in a global climate march near City Hall on Nov. 29 in New York City. All signs suggest that a Donald Trump presidency will be disastrous for the climate. During the campaign, Trump repeatedly called climate change, perhaps one of the most significant threats facing humanity, a “hoax.” He vowed to renege on U.S. commitments to the Paris Climate Agreement, undo Obama’s Clean Power Plan, and dismantle the EPA. Decisions made so far in this transitional period do not indicate anything different. Trump has assembled an energy and environment team that includes a climate-denier to head the EPA transition and executives from major fracking and oil companies. On the surface, this spells disaster for efforts to prevent dangerous climate change. However, it need not be. In fact, Trump’s presidency may just provide the jolt the climate movement needs to move policy forward. Social scientists have long known why climate policy is so hard to enact. The costs of reducing emissions are immediate and borne by a small, organized group of industries. The benefits, however, are less tangible and diffusely shared across the entire population. This makes collective action in favor of climate policy difficult. Indeed, despite the majority of Americans’ concern over climate change, it is still not commonly discussed amongst the electorate. It is now evident that the environmental momentum that brought Obama into the presidency in 2008 was not strong enough to produce lasting climate policy. National legislation got as far as the Waxman-Markey bill, the first climate policy to pass either house of Congress when the House approved it in the summer of 2009. That bill was then derailed when the Democrats lost their lock on the Senate, following the death of Ted Kennedy and election of Republican Scott Brown. The subsequent rise of the populist Tea Party movement and the Republican takeover of the House in 2010 meant that national climate legislation would not reappear during Obama’s presidency. In the face of such headwinds, since 2010, Obama’s climate policy shifted to focus on rule-making via executive orders rather than legislation. The Clean Power Plan is one such example, essentially shoe-horning 21st-century climate policy into existing 20th-century environmental legislation. Such executive action was always going to be subject to extensive legal challenges, regardless of the party that took the White House in 2016. But with Trump victorious, it is now vulnerable to being scrapped altogether. Where do we go from here? Perhaps recent populist movements can provide a valuable lesson for climate policy. For much of the late 1990s and early 2000s, the climate movement focused on building a coalition between environmental groups and major companies in the electricity, oil, and manufacturing sectors, believing this to be key in unlocking national climate legislation. This led to the formation of the U.S. Climate Action Partnership, which provided a unified voice across industry and environmental groups on climate policy in the early days of Obama’s presidency. But this top-down strategy, much like those for other issues of our time, overlooked the rising discontent resulting from decades of manufacturing contraction, middle-class wage stagnation, and increasing income inequality. Those forces ultimately killed national climate legislation in 2010 and have continued to gather strength, leading to Trump’s presidential victory. It may be time for advocates of climate policy to focus more on connecting with people. This is a good time to do it—awareness about how climate change could affect people has grown since 2008. Even before last week’s election result, climate change was increasingly becoming a part of the national debate on economic opportunity and inequality. The efforts of Bernie Sanders and groups like 350.org have shown that climate change can find populist momentum of its own. And it must find bipartisan support. Every major environmental legislation in U.S. history was enacted with bipartisan support following major threats to the environment. It is in both parties’ interest to address this crisis. Today, that threat appears ever more immediate. The president-elect has said he wants to dismantle the EPA, an act that would threaten the progress made on clean air and water achieved across the country over the past four decades. His denial of the existence of climate change runs counter to recent record highs in global temperature and increasing evidence of the local economic impacts of climate change across the U.S. His decision to pull out of the Paris Agreement could incite international backlash with adverse U.S. economic consequences—for instance, it could cause France to impose a carbon tax on imported American goods. Such moves by a Trump administration could trigger broad populist support for climate policy that, to date, has yet to emerge. There are hints that this is already happening. In the week since Trump’s election, many environmental organizations have received record-breaking numbers of donations. Many came from first-time donors; in fact, in just the past week, one group received gifts from as many new donors as it usually gets in an entire year. Indeed, the passion shown in Sanders rallies does not appear to be withering. Rather, it could gather strength in the coming months as people rally around Trump’s anti-environmental policies. Just as the Tea Party changed U.S. politics in 2010, climate change can also be a defining issue, changing the political landscape for the 2018 midterm elections. In that sense, 2016 can finally set the stage for the climate policy that has always been needed—stringent, lasting national climate legislation that puts the U.S. and the world on track to avoiding dangerous climate change.